Saybrook Point Inn & Spa recently opened Tall Tales, at right. It’s next to Three Stories. 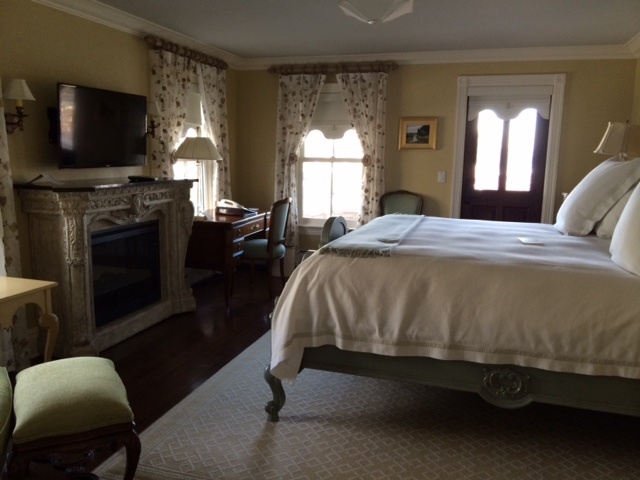 Two years ago, I was invited to visit Saybrook Point Inn & Spa and take a tour of the main property and its then latest addition, a luxury guesthouse named Three Stories. This past weekend, I went back to the inn to stay at a new and exquisite set of accommodations known as Tall Tales. Opened in February 2016, Tall Tales is an elegant yet private Italianate-style guesthouse right next door to Three Stories. Like its neighbor, Tall Tales gives off the feeling of staying at a quaint bed and breakfast inn overlooking the Connecticut River. 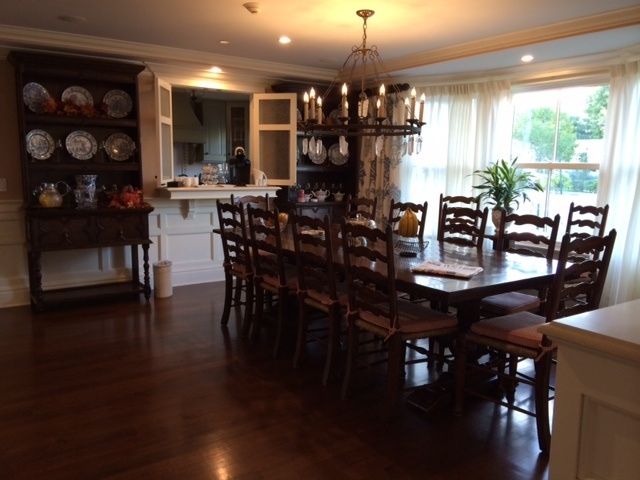 Tall Tales contains six rooms – two on each level sharing a common area – with each named after real-life individuals with significant ties to Old Saybrook. 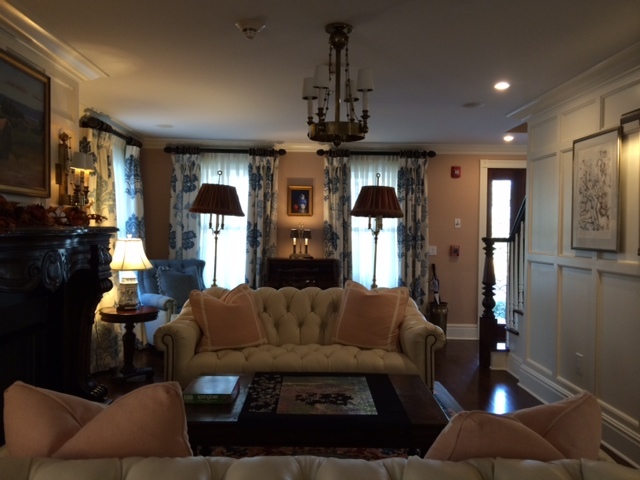 Each room also is decorated in different color schemes and furniture to reflect the character of their namesake. My room is called the Barbara Maynard, who is considered to the “Town Mother” of Old Saybrook for her involvement as a former First Selectman and Registrar of Voters. If Barbara saw her room, I think she would be proud. On the second floor of Tall Tales, the Barbara Maynard room contains a private seating area off of the main bedroom. Not that this area takes away from the bedroom. My bedroom has an electric fireplace, with an adjacent balcony. With a four-poster, king-size bed, the fine linens reflect a Victorian period look yet feel comfortable for a present-day guest. Its full bath contains classic fixtures, with a walk-in shower with a seat in place of a tub. Plus Tall Tales has Wi-Fi available in these rooms. The second floor also features a billiards room. On the first floor, there is a small kitchen area and an open-floor plan dining room where guests can grab a muffin or piece of fruit or use a Keurig to make instant coffee. 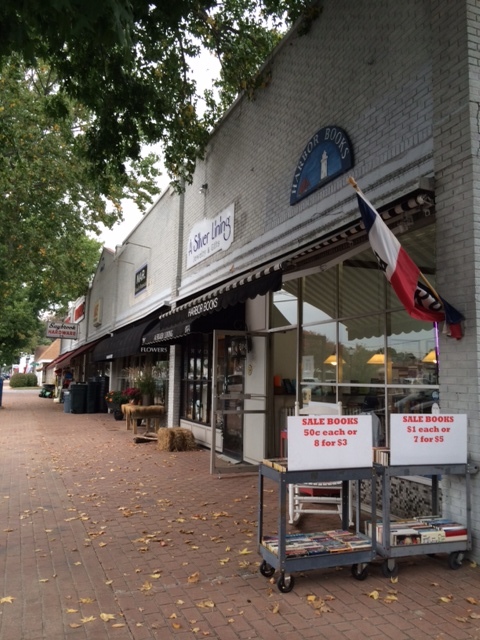 Parking is available behind Tall Tales and Three Stories. Both guesthouses are located across from the main inn. For dining, the main inn’s restaurant, Fresh Salt, serves breakfast, lunch, and dinner, plus a weekend brunch. Its menus are seasonal and promote New England’s agriculture. The inn’s Sanno Spa features 11 treatment rooms and services such as facials, massages, and manicures and pedicures. Amenities include indoor and outdoor pools, a state-of-the-art fitness center, a ballroom and event spaces, and a marina that can accommodate vessels up to roughly 200 feet in length. Editor’s Note: My stay at the Saybrook Point Inn & Spa was comped but the opinions expressed in this piece are entirely my own. 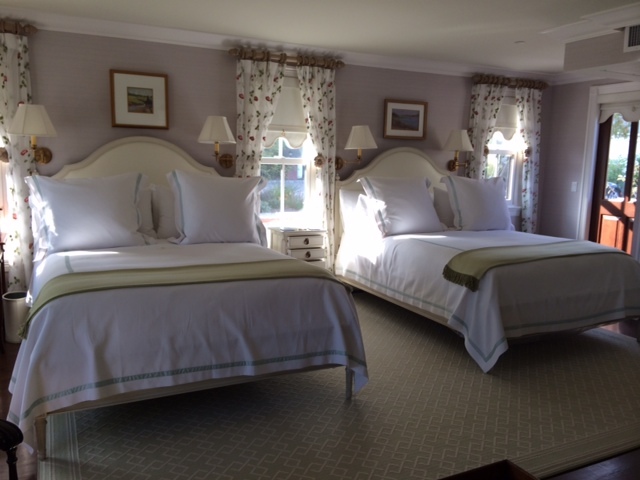 This entry was posted in Connecticut, Delta, Hotels, North America, Old Saybrook, United States and tagged Saybrook Point Inn & Spa, Tale Tales Saybrook Point Inn & Spa, where to stay in Old Saybrook on March 22, 2016 by She Is Going Places. Having grown up in Connecticut, I’m embarrassed to say that most of what I’ve seen of my state’s coastal region is by driving along our portion of I-95. But my latest work assignment was to change that. 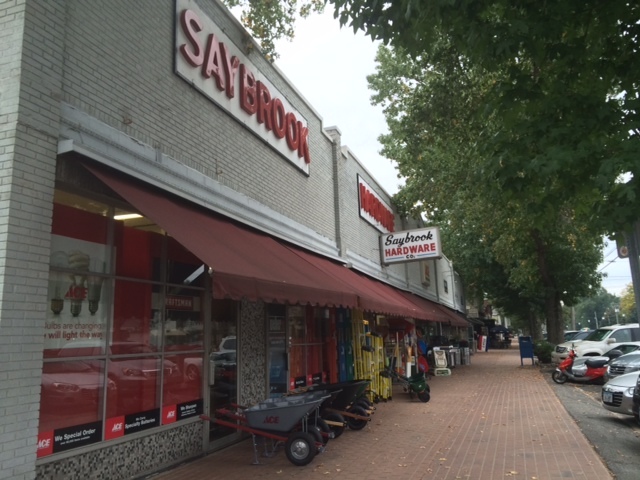 Recently, I drove up the interstate but this time I headed directly to the town of Old Saybrook. 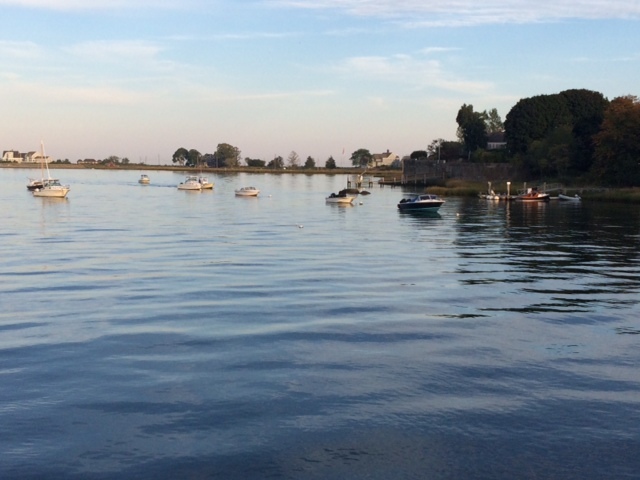 For a three-day visit, I was sent to stay at the Saybrook Point Inn & Spa, located right where the mouth of the Connecticut River and Long Island Sound meet. The back of main inn is also next to the Saybrook Point Marina, so waterfront views are clearly all around. Heading back inside, I got to scope out some of the main inn’s guestrooms (more than 82) which have fine furnishings that all reflect the simple elegance of country living decor. And then there are two outside accommodations that have their distinct setups. 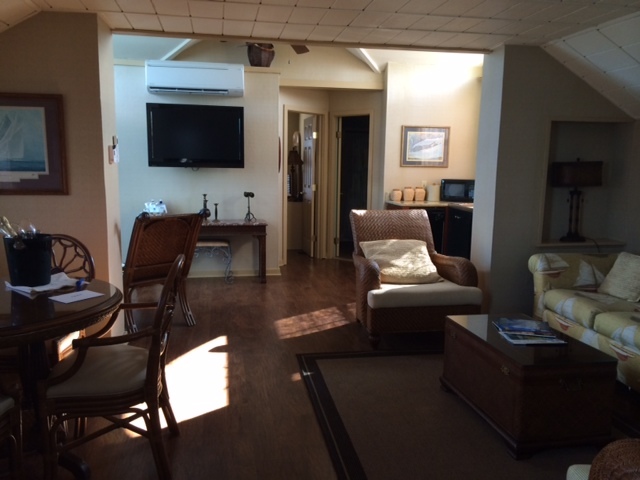 The first place is the Lighthouse Suite; yes, an actual lighthouse. Often in mind for couples or newlyweds, the lighthouse is set away from the main property and it’s set up as a studio apartment. Or, guests can go to where I was staying instead. Across the street from the main property, Three Stories is the inn’s renovated guesthouse (originally a single family home built in 1892) that opened in summer 2014. It instantly reminded me of a bed and breakfast when I walked in. On the main floor, there’s a living room and a breakfast area for grabbing a cup of coffee and a snack. On the lower level, there is a pool table and private lounge for hanging out (a worker jokingly called this area “a man cave”). 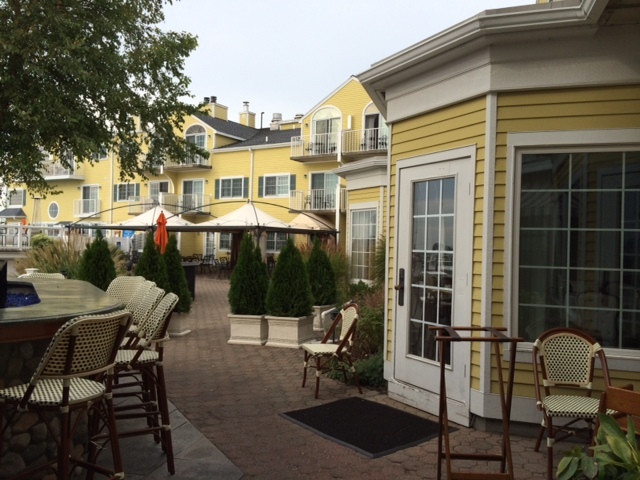 Three Stories gets its name from dedicating its guestrooms to a number of important Old Saybrook residents. Mine was for Ann Petry, an African-American author. There is also a room for Katharine Houghton Hepburn, the mother of actress Katharine Hepburn and a leading suffragette. And one for Anna Louise James, who was a history-maker on her own right: she was one of the first women and African-American pharmacists in the United States (and yes, she ran a local pharmacy). Three Stories’ original owner and railroad engineer William Vars has one, too. As a family-owned luxury inn, amenities include indoor and outdoor saltwater pools, a state-of-the-art fitness center and a full-service European spa called Sanno. For my spa visit, I had a Harvest Organic Facial, which featured Eminence skincare products made with pumpkin, yam or red currant. It was a very fall-inspired facial. The scents – and the treatment – were invigorating. 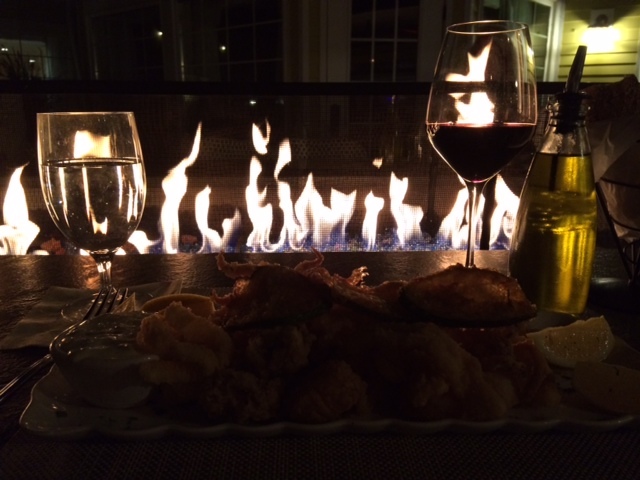 With dining, the inn’s restaurant, Fresh Salt, is about showing off New England’s culinary wonders. Menus are kept to what’s seasonally available and and incorporate sustainably grown and raised ingredients. Seafood is a big deal in this region of the United States, so it definitely has its place. And being from here, I felt I had to have it for dinner, so I ordered a combination platter of Connecticut oysters and scallops with Rhode Island calamari. It was quite good. Overall, Old Saybrook makes for a nice weekend getaway, perhaps for a couple celebrating an anniversary or getting engaged. Families, too, will enjoy You can get to there by rail (both with Amtrak and Metro North) or car. It’s also nice to see the town on two wheels. Bring a bike with you. 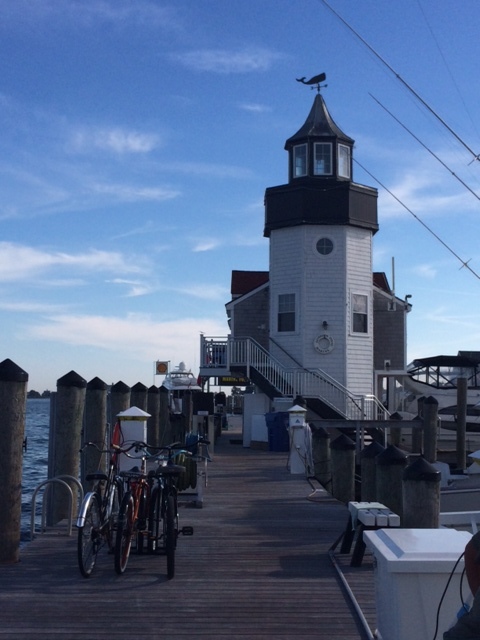 If you don’t have one, Saybrook Point Inn & Spa offers free bike rentals. Helmets are included and you get a map of the area. Starting from the inn, there are two routes you can take. I started with the shorter one, about a 3-mile or so trek over the Causeway to Fenwick, an adjacent borough and a summer colony. 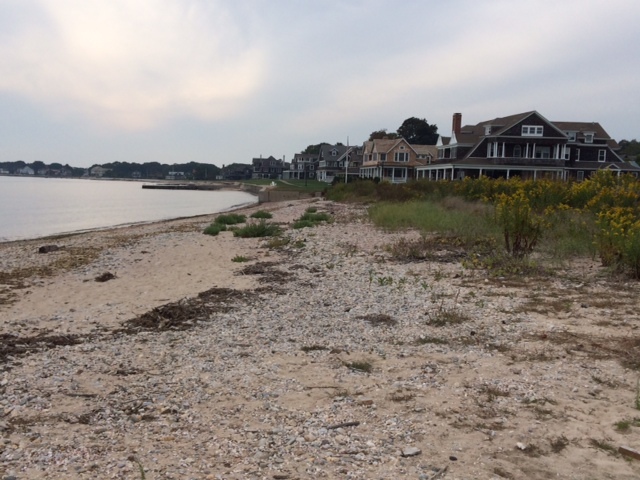 Katharine Hepburn lived in a beachside house here until her passing in 2003 and I stopped to take a quick look from afar. Or you could also take the 10-mile loop ride up to Main Street. You will make your way to Old Saybrook’s downtown area lined with shops and restaurants as well as historic homes and an arts center/movie theater named for Katharine. For meals, I recommend Liv’s Oyster Bar, which has a nice happy hour with an the oyster of the day special, and Paperback Cafe, for breakfast and lunch. Nature lovers should head over to Fort Saybrook Monument Park, a 17-acre park right across from the main inn. You can get a nice panoramic view of the Connecticut and learn more about Old Saybrook’s history through storyboard displays and a bird sanctuary. And let’s not forget about spending time on the water. Through one package, Saybrook Point Inn & Spa provides a leisurely sunset cruise aboard the Real Escape, a 56-foot private yacht that departs directly from the Saybrook Point Marina. The marina also offers charters for fishing, day cruisers, and groups and can accommodate seasonal boaters, the marina accommodates vessels from 13 feet to 130 feet. But then, taking in the scenery in Old Saybrook is just as great. Editor’s Note: My lodging, meals and spa treatment at the Saybrook Point Inn & Spa were comped but the opinions expressed in this piece are entirely my own. I paid for any meals I had outside of the inn. This entry was posted in Connecticut, Historic Places, Old Saybrook, United States and tagged coastal Connecticut towns, Connecticut River, inns in Old Saybrook, Old Saybrook Connecticut, Saybrook Point Inn & Spa, what to do in Old Saybrook, what to see in Old Saybrook, where to stay in Old Saybrook on October 14, 2014 by She Is Going Places.